A black and white photograph of the interior of the Brooklin Baptist Church. Church pews can be seen as well as decorative plants. An organ is located in the centre of the photograph. This church was located at 45 Cassels Road East at the south west corner of Cassels Road and Church Street. It was built as a Bible Christian Church in 1876. From 1884 to 1916 it was a Baptist Church. From 1920 to 1965 it was the Whitby Township hall and from 1965 onwards it has been the Brooklin Community Centre. 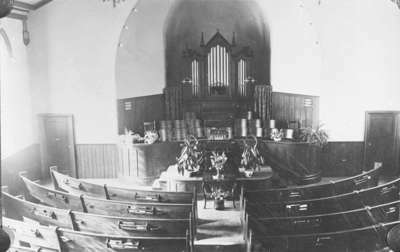 Interior of Brooklin Baptist Church, c.1909, Photographer Unknown. Whitby Archives 25-000-056.